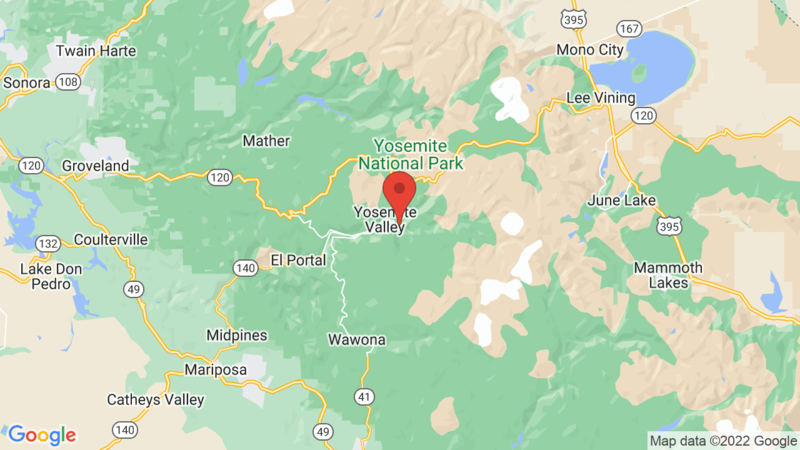 Upper Pines Campground is open year-round and has 238 campsites set in a beautiful Ponderosa pine forest and is the largest of three campgrounds in the Yosemite Valley. The other two campgrounds are Lower Pines and North Pines. The campground has a dump station, flush toilets and drinking water. There is a maximum of 2 vehicles and 6 people per site. Click on the ‘Make A Reservation’ button to access the Rec.gov site to check specific sizes for each campsite and make reservations. Also, tent (only) camping is not allowed in campsites designated as an ‘RV site’. North Pines campsites are good for tents, trailers and RVs (up to 30 feet). Each campsite has a table, fire ring/grill and food storage locker. Upper Pines is quite popular and is a short walk to Curry Village where you can get a hot shower and some eats at restaurants. Curry Village also has Wifi access, a grocery store, laundromat and cross-country ski rentals. World famous Yosemite National Park offers spectacular scenery and amazing wonders that boggle the imagination. Outdoor recreation includes hiking, backpacking, biking, kayaking, photography, climbing, rock climbing, fishing, nature exhibits, museums, camping and wildlife viewing. There are also many historic sits to visit throughout the Park. Horse stables are also located near Upper Pines campground with trail rides available to the public. You can also rent a raft and float the Merced River. Other campgrounds in Yosemite National Park include Crane Flat, Wawona, Hodgdon Meadow and Tuolumne Meadows. Visted Upper Pines Campground lately? We'd love to hear about your adventure. Did you find us useful? Did we forget something? Anything our community should know before heading out to Upper Pines? Officially, one of my California favorites. Very few are on a slope, and of those the slope is very mild. Fires in the rings are limited to between 5pm and 10pm, May through September. Definitely the cooler of the campgrounds in September as the cliffs put the campsites in shadow after 2-3pm; while the North and Lower pines campsites are in the sun until 5:30-6:30. Makes a big difference on the 90+ degree days. 2 shuttle stops are close by, #19 at front and #16 at back. Even got to meet Greg while walking the campgrounds, too! Site 500 is amazing and off to the side. I highly recommend this site. It is large and fit our 31 foot travel trailer easily! Upper Pines #s only go up to 240 – did you mean to review North Pines? Hi David Blue, Are you saying site 500 in Yosemite Upper Pines campground was great for your 31 foot trailer? Hi Ginny Murray, are you asking whether site 500 in Yosemite Upper Pines was great for David Blue’s 31 foot trailer? Hi Peter Seesall, are you asking Ginny Murray is she is asking whether site 500 in Yosemite Upper Pines was great for David Blue’s 31 foot trailer? Hi Ceara Wilford, are you asking Peter Seesall if he is asking Ginny Murray if she is asking whether site 500 in Yosemite Upper Pines was great for David Blue’s 31 foot trailer? Booked upper pines site 112 for June. Our rv is 27 foot but it says max vehicle length 24 foot. Does anyone know of site 112 will fit a 27 foot rv? Those sites are tight. When the say 24′ max, it is. Keep your generators at home! I got site 220 but don’t have an RV. Will I be OK with just tents? Yes – just tents in Upper Pines #220 is fine/allowed. Thanks! Do you know approximately how many tents I can pitch at that site? Do all Upper Pines sites accommodate RVs? Ours is 28′. Yes all Upper Pines campsites will accommodate RVS at least 30 feet. Some campsites are larger. Hello, when I booked my sites, it said the max length was 27 ft for an RV. Mine is 29.5, will it fit? When I applied the filters in my search, there was only one site that would accommodate anything larger than 30 ft. Will my 29.5 fit in site 194 and 192? The final call will be up to the camp host. If your vehicles/trailer/RV is extended into the road, the camp host may not allow it and ask you to vacate. Is there some information available to find out which campsites accommodate RVS that are larger than 30 feet? Ours is 32 feet and we have site 187. Thank you. Click on the ‘Make A Reservation’ button to access the Rec.gov. Once on Rec.gov, click on ‘Show Sites’ and then the specific campsite number to see details (including maximum vehicle length, etc.). For Upper Pines campsite 187, it shows that the maximum vehicle length is 24 feet (RV) and the maximum trailer length is 12 feet. According to the Rec.gov, Upper Pines campsite 22 has a maximum RV length of 27 feet, and a maximum trailer length of 18 feet, and/or a total maximum length (two vehicles) of 27 feet. With that said, site 22 will fit a 27 foot motorhome/RV. If you’re renting a trailer of around 25-27 feet, that too should fit, but might be a bit snug up against the fire grate. We’ve seen people fit larger trailers in smaller sites by also parking their truck/vehicle diagonal (or at a bit of an angle) across the front of the parking pad. You should be good to go – have a great trip and enjoy all the big water this year! I have stayed in Upper Pines a few times and today I got a reservation for Labor Day, site 216. I didn’t want to cancel this site and missing out on getting a space but I realize this site is for RVs/Trailers. Will I be ok tent camping at this spot? I really do not like the new recreation.gov website. Before the filters were easier to use. Yes, you can tent camp in campsite 216 at Upper Pines. Have a great time! Thanks for the clarification James! We made a note of it in our overview – no tent camping allowed in campsites designated for ‘RVs’.